Since I can't seem to concentrate enough to do any art, I've been puttsing in the jardin. It's starting to come together. The wall pots are up and planted. I've painted the wooden bird houses. I think it really gives that wall a life. The plant which is sitting in the middle of the table will go in the talavera post which sits on its side on the tall table. 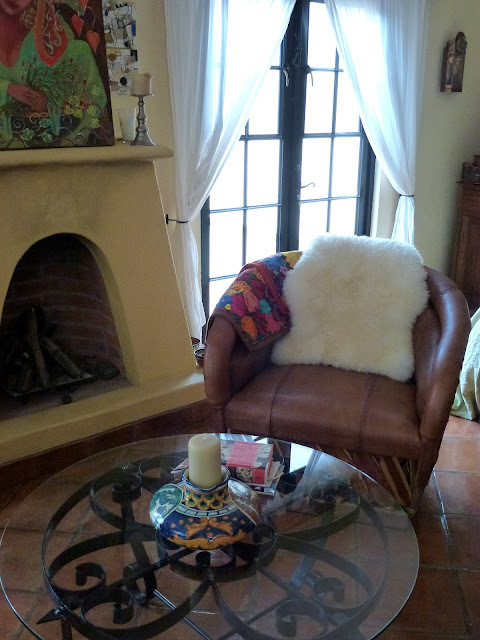 A cozy nook for sangria with a friend. 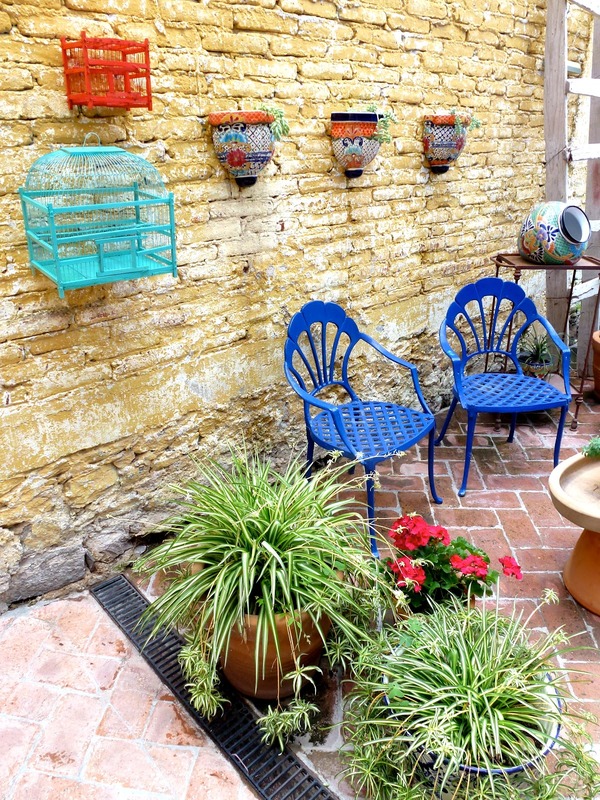 The opposite wall was treated to a talavera hanging planter. If you see the orange flowers tucked into the plants on the bricks, those will be in the wall hanger. A new addition to the living room. Beautiful cowhide Mexican chair and a half. Just right for Habibi and me. The colourful pillow covers are from Oaxaca and will be plumped up with stuffing soon. You've created SUCH A BEAUTIFUL SPACE!!! I love it! Those wall pots are gorgeous, the whole area, just so pretty, Donna. Love all the textures and colors. I'd feel very much at home there. I'm still waiting on one of your big canvases on the wall! I really love your colorful jardin. :) I wish i had a sense of doing something like that. I don't think a garden could look more inviting. I'd love to sit and share a sangria with you there. Just looking at your outside space is peaceful, Donna! Well Done!